Barcelona's famous architectural son, Antonio Gaudi, left his mark on the city nowhere more prominently than in the gardens of the Parc Guell. The park, sited on Camel Hill and offering splendid views of the city, was originally planned to be a garden city suburb, but only two houses were completed before it was turned into a public recreational park. The gardens are festooned with examples of Gaudi's strange and mesmerising work, including flights of stairs, columns and a plaza decorated with mosaics. Famous features include Gaudi's dragon, a mosaic lizard straddling two staircases which is frequently replicated in souvenir stores, and the Sala Hipostila, or Doric Temple, which is a forest of 88 stone columns. 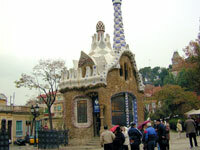 Gaudi enjoyed experimenting with natural forms in his art and the park is a fascinating mixture of art and nature. The pink fairytale house standing at the entrance to the park was once home to Gaudi and his niece, but is now a museum containing some Gaudi-designed furniture, décor, drawings and portraits of the architect. Guided walking tours of the park are available and usually very informative, but it is enjoyable to stroll around without a guide too. To fully explore the park at your leisure you will need at least half a day - don't forget the camera!